Join the discussion about what the City of Winnipeg needs in a poverty reduction plan. 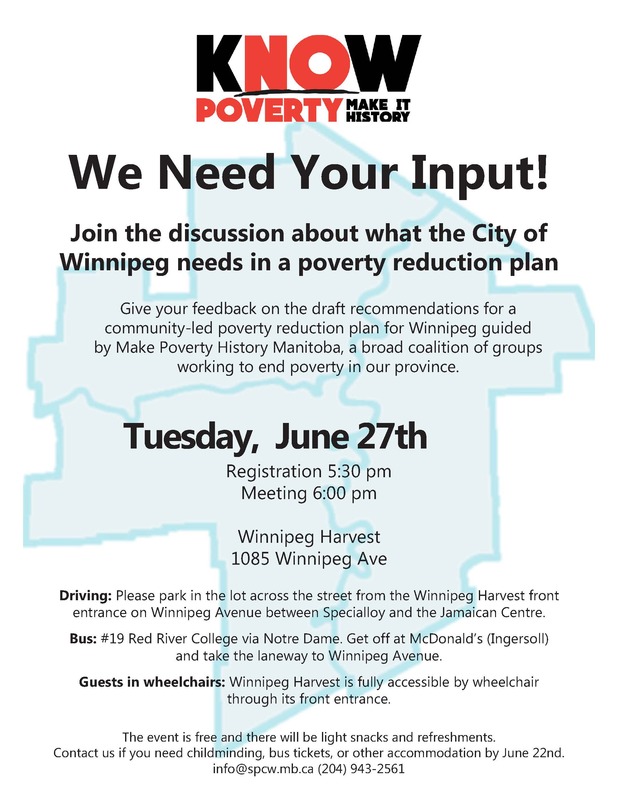 Give your feedback on the draft recommendations for a community-led poverty reduction plan for Winnipeg guided by Make Poverty History Manitoba, a broad coalition of groups working to end poverty in our province. The event is free and there will be light snacks and refreshments. Contact us if you need childminding, bus tickets, or other accommodation by June 22nd. The revised list of draft recommendations is attached and now available to the public to review. Driving: Please park in the lot across the street from the Winnipeg Harvest front entrance on Winnipeg Avenue between Specialloy and the Jamaican Centre. Bus: #19 Red River College via Notre Dame. Get off at McDonald’s (Ingersoll) and take the laneway to Winnipeg Avenue. Guests in wheelchairs: Winnipeg Harvest is fully accessible by wheelchair through its front entrance.